Akhenaten (“He who is of service to the Aten” or “Effective Spirit of Aten”) is one of the most famous pharaohs of ancient Egypt, despite the attempts of later rulers to omit him from the lists of kings. 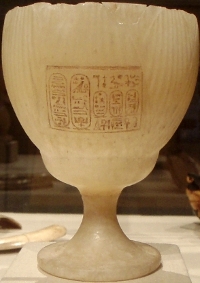 He began his reign under the name Amenhotep IV (“Amun is satisfied”). As the son of Amenhotep III, he inherited a prosperous and peaceful nation. He was crowned pharaoh with all of the usual flair and began an apparently normal reign. It is thought that his father reigned as co-regent during the first few years, but this is disputed by some scholars. The co-regency is supported by similarities in the artistic style during the later years of Amenhotep III and that of his son, but the style may well have developed before Akhenaten (then Amenhotep IV) became king. However, it became clear early in his reign that the young king was prepared to go against convention. In his first year, he built a Temple dedicated to the Aten at the perimeter of the Temple of Amun at Karnak. He took the unconventional step of celebrating a Sed-festival in his third year (this festival was usually conducted in the thirtieth year of a Pharaoh’s reign) but still presented the Aten as a variant of Amun-Ra. The Eighteenth Dynasty was characterised by powerful women, but Akhenaten seems to have granted his chief wife, Nefertiti, with power surpassed only by the Pharaoh himself. Some scholars even suggest that she ruled as co-regent for part of his reign. Akhenaten built several structures at Karnak during the early part of his reign , while he was still using the name Amenhotep (IV). He built the temple “Rud-menu”(“Enduring in monuments of Aten for eternity”) and a palace complex called Gempaaten (“the Aten is found in the mansion of the Aten”) where the royal family lived during the winter months. In the fifth or sixth year of his reign, he changed his name to Akhenaten, and constructed a new capital city, Akhetaten (“Horizon of Aten”) at modern Armarna, in an area not associated with any other god. He vowed never again to leave the boundaries of the city. Then, in the ninth year of his reign, he declared that Aten was the only god, and that he was the only intermediary between the Aten and the people. He ordered Amun’s name to be cut from his temples throughout Egypt and even defaced the name of his father because it contained the name of Amun. In a number of instances inscriptions containing the plural “gods” were also removed. Pharaoh Akhenaten died in his seventeenth year on the throne and his reforms did not survive for much longer. His co-regent and successor Smenkhare, died after a short reign and power passed to the boy king, Tutankhamun (originally Tutankhaten). During his reign the city of Akhetaten was abandoned and Amun and the other gods were reinstated. Once the “Atenist heresy” had been discredited, Akhenaten’s image and names were chiseled from his monuments and his sun temples were dismantled. His glorious city crumbled back into the desert and his name (and that of his two immediate successors) was left out of the Kings lists produced shortly after. Recent genetic testing has confirmed that the male mummy buried in KV 55 died in his fifties, ruling out the earlier proposition that the body was that of Smenkhare. It is now generally thought that the mummy is in fact that of Akhenaten. Interestingly, it appears that this mummy was intentionally defiled by those with a religious or policital motivation. His face mask was torn and his name obliterated, but precious objects were left in place, confirming that the damage was not the work of tomb robbers but persons with a religious or political motivation. Akhenaten has been described as a visionary who cut through the formality of Egyptian religion to establish a connection with one God, the Aten. 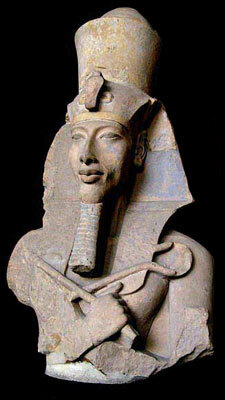 To some, Akhenaten was the first Monotheist who may have been inspired by Joseph or Moses. However, it is by no means as simple as that. Although Akhenaten’s religion did center on one god, it was not strictly monotheistic and was by no means identical to the Israelites. It seems that the Apis cult was maintained and other gods are still mentioned in inscriptions (although they are usually solar gods or personifications of abstract ideas). In fact, the names of the Aten (which were written in a cartouche) describe the god in terms of the other gods. Furthermore, it seems that the personal relationship with the Aten did not extend to the common people, just the Royal Family. Akhenaten and his family are frequently shown worshipping the Aten or simply enjoying everyday activities beneath the protective rays of the Aten disk, reinforcing the link between the king and his god. 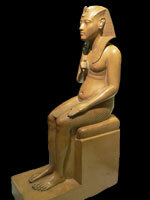 Ordinary people could not worship the Aten directly, they worshipped the King and the royal family. This gave the king absolute power over secular and religious life in Egypt. For this reason, some have suggested that Akhenaten’s reasons were cynically political. They argue that the king was worried about the growing power of the priests of Amun, as his father Amenhotep III had been. By establishing a new order which rejected Amun in favour of the Aten (who was accessible primarily to the king) he took religion back from the priests. As well as Nefertiti, Akhenaten surrounded himself with a number of powerful women whom he clearly adored and respected. 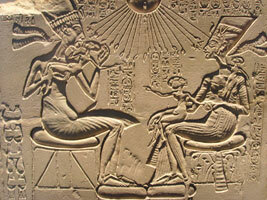 Each of the royal women had her own sunshade temple where she could worship the Aten. They were generally located within beautiful gardens complete with ritual pools where the wonders of nature could be enjoyed. The Armarna women, in particular Nefertiti, seem to have represented the feminine aspect of the Aten as creator. Akhenaten was often depicted with an elongated jaw line, wide hips and a round belly. This development was a complete break from all of the conventions of ancient Egyptian art, and has led to some fairly wide speculation. Was the pharaoh developing a new art form, or suffering from a physical affliction? Both Smith and Aldred attributed the “deformity” to an endocrine disorder called Froehlich’s Syndrome. In males, this disorder is typified by an elongated face and an androgynous figure. However, it also hinders sexual development and causes severe learning difficulties, obesity and impotency. Pharaoh Akhenaten had many children, and while his sculptures may give him an androgynous appearance, he is not obese. There is no evidence that he suffered from a severe learning disability, and it would certainly have been difficult for him to have succeeded with such a bold challenge to tradition without being fairly astute. Furthermore, he apparently wrote a number of poems or hymns including the famous Hymn to the Aten. Thus it seems unlikely he was suffering from Froehlich’s Syndrome. Other theorists (such as Bob Brier) have suggested that the king actually suffered from Marfan’s syndrome. Many sufferers have a long face, slender tapered fingers, long arms and legs, and a curvature of the spine. However, the disease does not affect intelligence or fertility. Marfan’s syndrome is hereditary, and could help explain the high mortality rate within the family. Three of his daughters, and his co-regent Smenkhkare all died young. However, Tutankhamen, does not appear to have suffered from the condition. This could be explained if Tutankhamun was not his son, but then, who was his father? Proponents of the view that Akhenaten was physically disabled note that he was barely mentioned during his father’s reign and suggest that he was hidden away because of his deformity. However, it was fairly common for the male offspring of the king to remain in the shadows until they held a position of specific importance, such as heir or co-regent, and Thuthmosis (Akhenaten’s elder brother) was the first choice as heir. Akhenaten only rose to importance when his brother died. With only pictorial evidence of a physical abnormality it is dangerous to jump to conclusions. Egyptian art often employs symbolism to create layers of meaning for a scene. As the god Aten was hailed as “The mother and father of all people”, and Akhenaten was the representative of the god on earth, he may have chosen the androgynous image to show that he was more than just a man; he was the embodiment of the Aten. No mummy has yet been identified as being that of Akhenaten, and so the controversy continues. A priceless cache of diplomatic letters written on clay tablets was discovered in the city of Akhetaten. The “Amarna Letters” were written in cuniform, the lingua-franca of the ancient world, and arrived from imperial outposts and foreign allies. The letters suggest that he had withdrawn from the world and that Egypt was no longer taking her part in world events. There are a number of letters from governors and kings of subject nations begging for help, usually money. The authors seem to feel abandoned by their powerful friend and left to the wolves. Other evidence suggests that Akhenaten quarreled with the king of Mitanni, former allies of Egypt, and concluded an alliance with the Hittites! This warlike nation then attacked Mitanni and stole their land. Many other small nation states (who were also allied to Egypt) rebelled against the Hittites and wrote begging Akhenaten for help, but it seems that he did not respond and the Hittites captured or killed their leaders and seized a significant amount of land. It is suggested that Akhenaten increasingly left government and diplomats to their own devices. This made the vizier, Ay (father of Nefertiti), and the general Horemheb (who was married to Ay’s other daughter Mutnodjme) very powerful, and both men went on to become pharaoh. During the Amarna period there seems to have been widespread famine and disease. It is thought that the plague, or the first recorded epidemic of influenza spread through Egypt and the Middle East, killing thousands. It seems that the Hittite King, Suppiluliumas, died in the epidemic and it is also possible that it claimed the lives of a number of his children. Of course, many commentators have suggested that this was the biblical plague which accompanied the exodus, but there is no evidence in support of this view. It has also been suggested that Amenhotep III had tried to placate the (solar) goddess Sekhmet, “the lady of pestilence” to avert the plague, and when this failed his son Akhenaten went one step further and appealed directly to the sun god for deliverance. In any case, later Egyptians may well have viewed the plague as retribution for the neglect of the traditional gods of ancient Egypt.